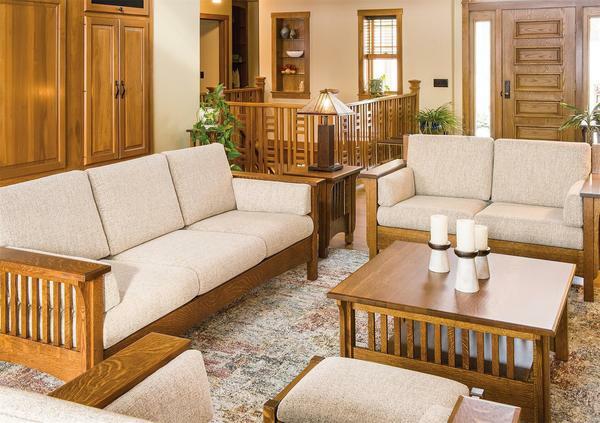 Our Pioneer Living Room Set brings mission style furniture crafted from solid wood to your home. The Pioneer three-seat sofa features mission-style slats on the sides and back, solid armrests, curved angles, and upholstered cushions. The Pioneer Loveseat is made for two, and also features the slat construction and curves that define mission-style furniture. The Pioneer chair is a roomy complement to the sofa and loveseat. A matching ottoman provides a place to rest or feet or an extra seat when company is over. The mission-style coffee and end table complete the living room set. The simple lines of mission furniture allow it to work with a variety of design styles -- Arts & Crafts to contemporary. Mission style especially pairs well with dark colors like maroon and forest green, as well as warm neutrals. It shines along with native-inspired prints and artwork but also pairs well with plaids and stripes. 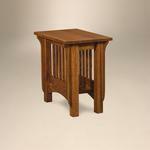 Learn about the history of mission-style furniture on our blog, Timber to Table. Shown in Quarter Sawn White Oak Wood with a Michael’s Cherry finish with C2-6 Normal Fabric.